Portmeirion Village01766 770000work Theme ParkDesigned by Sir Clough Williams-Ellis in 1925, Portmerion was built in imitation of a rustic Italian village, to demonstrate how a naturally beautiful place could be developed without spoiling it. Sitting at the feet of Snowdonia it makes for a charming dislocation that is truly unique. Portmeirion's place in popular culture has been set in stone as a result. Ellis designed Portmeirion on the town of Portofino in tribute to the atmosphere of the Mediterranean. The town that sits at the edge of its own Snowdonian peninsula incorporates fragments from several pre-existing buildings, assembling them in a post-modern bricolage. The ironic sense nostalgia and pastiche that emanates from Portmeirion has been a key element of its architectural legacy. The iconic sixties spy drama, The Prisoner, led to an avalanche of programmes using Portmeirion as a setting, and many more as an inspiration (Jools Holland, Noel Coward, Paul McCartney, Steven Fry, Supergrass and Iron Maiden are just a few names on that roll call). 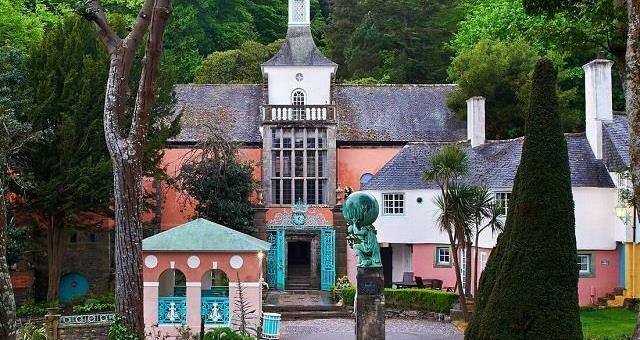 Designed by Sir Clough Williams-Ellis in 1925, Portmerion was built in imitation of a rustic Italian village, to demonstrate how a naturally beautiful place could be developed without spoiling it. Sitting at the feet of Snowdonia it makes for a charming dislocation that is truly unique. Portmeirion's place in popular culture has been set in stone as a result. Previously the village had entertained Frank Lloyd Wright, Gregory Peck and Ingrid Bergman, making Portmeirion undoubtedly the jewel in the glittering crown of Snowdonia. Portmeirion Village open: 5 November 2018 - 31 March 2019 09:30 - 17:30, 1 April - 3 November 2019 09:30 - 19:30. In advane online: Adult £7.00, Senior/Student £6.00. Continue west on the A487 through Penrhyndeudraeth and straight on at the roundabout (signed for Minffordd); pass the railway station and the entrance to Portmeirion will be on your left.